SHARK is very pleased to announce that a planned two-day Labor Day live pigeon shoot, that was to be held at the Wing Pointe canned hunt club in Berks County, PA, was cancelled due to lack of shooters! This victory is added to our major victory of forcing US Senator Jim Inhofe of Oklahoma to stop holding pigeon shoots at his annual fundraiser. Inhofe's next shoot was to be held this coming Friday. Instead, a thousand lives will be saved. SHARK has waged a major campaign against Wing Pointe's pigeon slaughters going back to November 2010, when we first documented a massive pile of dead and dying pigeons left after a pigeon shoot. 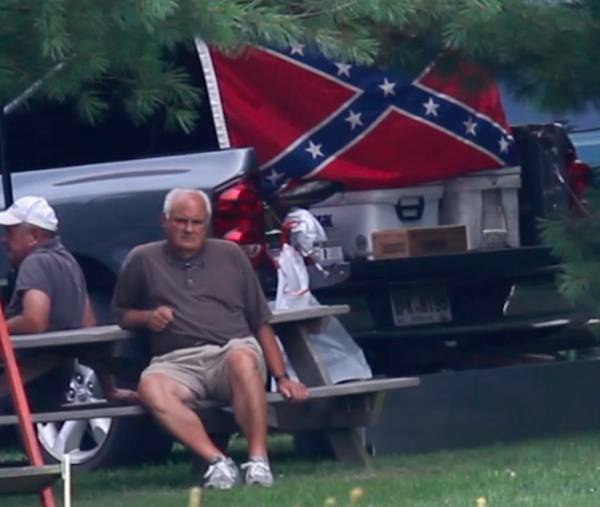 Wing Pointe owner, Joe Solana, sitting near a Confederate flag at one of his pigeon shoots. Apparently Solana didn't realize that Pennsylvania fought for the North in the Civil War - but this did help us expose the bigoted undercurrent present at these cruel shoots. SHARK has been at Wing Pointe for 6 years, released dozens of videos that have received millions of views and documented both pigeon shoots and tower shoots, where pigeons, pheasants and chukars are hand thrown into the air and shot for fun. SHARK's intense exposure of Wing Pointe tower shoots forced the termination of those vile killing sprees - another victory for our animal friends. Our victories have come at a cost beyond dollars. The pigeon shooters and their supporters have used violence to try to stop us. SHARK investigator Janet Enoch was attacked as she sat in a vehicle. SHARK President Steve Hindi was hit with a metal dog chain and left bloodied. Steve was also intentionally hit by a van. A worker for the owner of Wing Pointe held Hindi and SHARK Investigator Janet Enoch at gun point after one protest. As we continued to expose Wing Pointe's shoots and killers, we witnessed a dramatic decrease in attendance of shoots at Wing Pointe. And all of this represents just a fraction of our work to expose Wing Pointe. 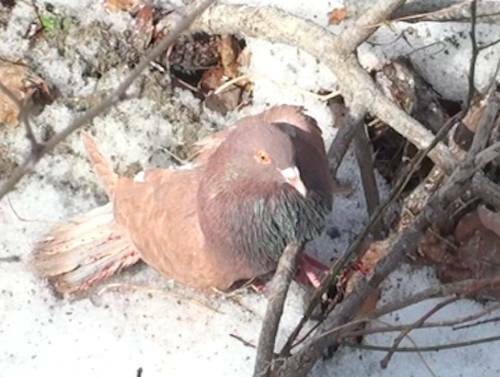 One of the victims of a pigeon shoot at Wing Pointe. This bird flew all the way from the shooting arena to where our investigator was filming on a nearby property and then died. The point is, the cancellation of the two-day shoot was no accident. If not for SHARK, this shoot would have happened. That is a fact. Please remember that when you see others talk about our victories (while not naming SHARK) and without having the courtesy to mention our hard work, and the blood, sweat and tears we've shed filming shoots and rescuing victims. This is not the end of pigeon shoots at Wing Pointe, but it is a very important victory and quite symbolic as Wing Pointe started doing Labor Day shoots in memory of the Hegins, PA annual Labor Day shoots which ended in the early 1990s.